Sonic Acts Festival 2017 opened on 23 February with a full evening of Vertical Cinema films. 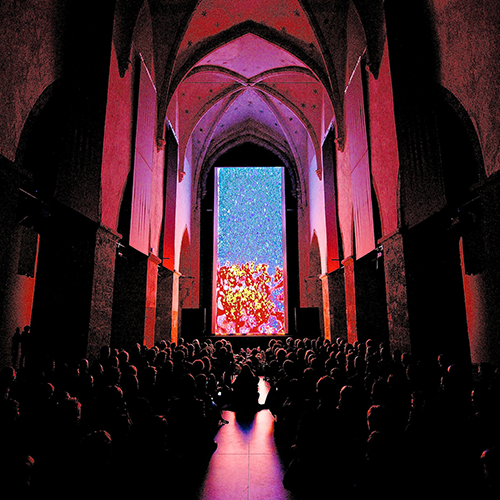 The premieres of four new films – commissioned by Sonic Acts and partner organisations – were presented in a full house at Paradiso in Amsterdam. Sonic Acts has commissioned four new Vertical Cinema films by Susan Schuppli, Lukas Marxt, BJ Nilsen and Karl Lemieux, and HC Gilje. Last week Vertical Cinema traveled to Leipzig for a screening at the alternative cinema festival GEGENkino. 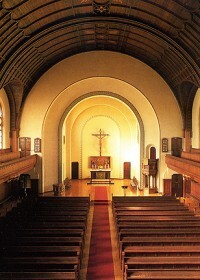 The screening, a German debut, attracted more than 400 visitors filling the seats of the Paul Gerhardt Church. Vertical Cinema will be screened in Germany for the first time as part of the GEGENkino festival programme on 28 April 2016. 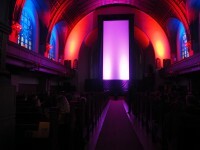 Vertical Cinema is a series of fourteen commissioned large-scale, site-specific works by internationally renowned experimental filmmakers and audiovisual artists, which are presented on 35 mm celluloid and projected vertically with a custom-built projector in vertical cinemascope. The programme premiered in 2013 and has since been screened at museums and festivals around the globe. The fourteen experimental films made by Tina Frank (AT), Björn Kämmerer (DE/AT), Manuel Knapp (AT), Johann Lurf (AT), Joost Rekveld (NL), Rosa Menkman (NL), Billy Roisz (AT) & Dieter Kovačič (AT), Makino Takashi (JP) & Telcosystems (NL), Esther Urlus (NL), Martijn van Boven (NL) & Gert-Jan Prins (NL), Susan Schuppli (UK), Lukas Marxt (AT), HC Gilje (NO), BJ Nilsen (SE) & Karl Lemieux (CA) are screened live on a vertical monument. They are a unique blend of abstract cinema, structural experiments, found footage remixes, chemical film explorations and live laser action. The artists offer their view of ‘vertical axis art’, and the results of this challenging commission are fascinating.